One of the most popular online poker rooms on the Horizon Poker Network just got better! Juicy Stakes has added three more freeroll poker tournaments to its daily schedule. The winner of each one will advance to tournaments with $200 and $300 prize pools that weekend. 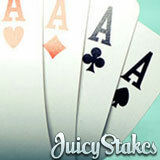 Juicy Stakes has also started giving new players 100 free Blackjack or video poker bets in its online casino. The new freeroll poker tournaments are held every Monday to Friday at 4:30, 6:30 and 8:30 pm Eastern. The winner of each tournament will go on to the Sunday $300. The second place players will be entered in the Saturday $200 and 4th – 7th place players will sit down to the Friday $100 Big Bounty. Another eight players will get tickets to the daily $100 for just a dollar. Three other new tournaments will award cold, hard cash. Every Monday and Tuesday at 9 pm there will be a freeroll with a $150 prize pool. Wednesdays at 9:00 the prize pool is $250. In addition to its busy online poker room, Juicy Stakes also operates a very popular online casino with a complete suite of casino games. There are four versions of Blackjack and both American Roulette and European Roulette. There’s also a great selection of slot games from Worldmatch such as the new Disco Slot 80 HD. As a welcome bonus, new players at Juicy Stakes now get 100 free Blackjack bets or 100 free video poker lines. Each free bet is for $1. Players can make their free bets on any Blackjack or video poker game in the Juicy Stakes Casino: Blackjack, Face Up 21, Double Draw, Perfect Pair, Deuces Wild, Bonus Poker, Double Bonus Poker, Jacks or Better, Aces and Faces, Double Joker Poker, Tens or Better, Joker Poker Kings, All American Joker Poker Aces or The Saloon).